TUCKER, Alfred R. Eighteen Years in Uganda and East Africa. By Alfred R. Tucker, Bishop of Uganda. In two volumes. With illustrations from drawings by the author and a map. London: Edward Arnold, Publisher to the India Office, 1908 8vo. (1). xvi,359pp. photogravure frontispiece and 29 plates, (1 in colour), coloured folding map.(2). xii,388pp. colour frontispiece and 29 plates, (2 in colour), appendix, index. Alfred Robert Tucker (1849 – 1914) was sent to East Africa as a bishop in 1890. When in Baganda he supported the Anglican cause and sided with Captain Lugard of the Imperial British East Africa Company in establishing a British sphere. He returned to England in 1893 to gather support for the continuing British occupation. 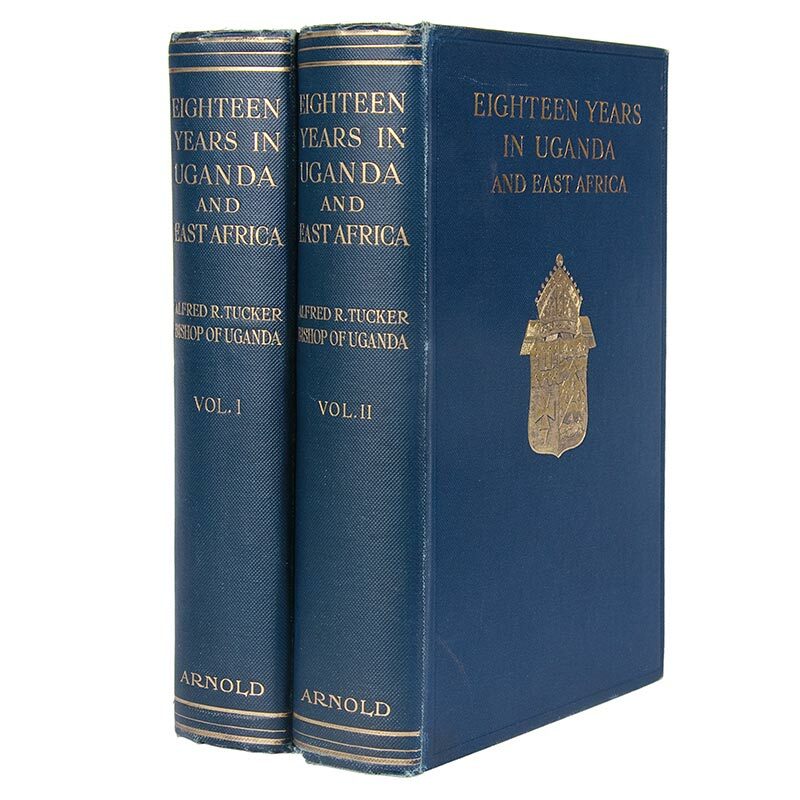 However he was equally critical of colonial abuse and spent the last ten years of his life in promoting the Ugandan church as distinct from the sometimes paternalistic attitude of the Anglican missionaries; in this he was largely successful. A fine set in the publisher’s gilt decorated dark blue cloth.